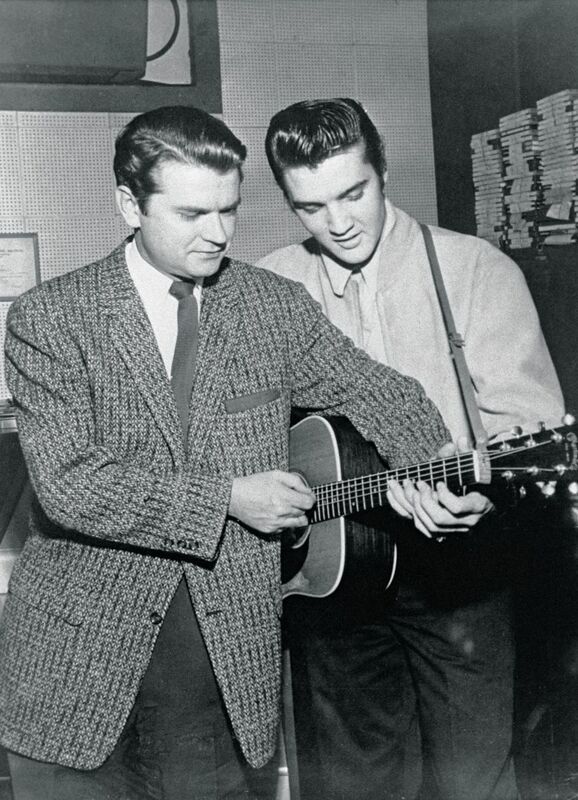 Following a 1956 vacation in Vegas, Elvis Presley walked into Sun Records on December 4 and interrupted a Carl Perkins recording session – leaving a legendary jam on tape and a myth in the making. Elvis, with Vegas Showgirl Marilyn Evans, showed up at Sun Records where Carl Perkins and his band with Jerry Lee Lewis hired for the session was recording. Elvis’ drop by turned the session into The Legendary Jam Session. 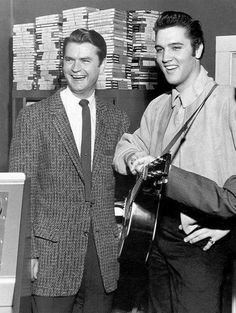 Sam Phillips called the press, leveraged the unexpected visit for publicity and called Johnny Cash, newly signed to the label for the photographs. The Perkins session that became known as The Million Dollar Quartet was recorded by Phillips. 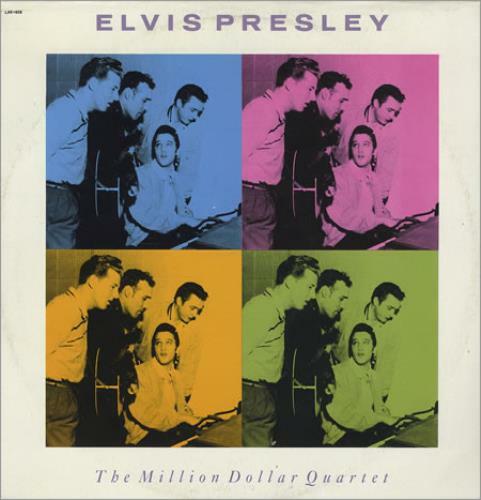 knowing it could never be released – already sold to RCA Presley was a national and breaking international star – while Perkins and Cash were on his label. Jerry Lee Lewis was still trying to convince Phillips, and was there as a session musician. Phillips recorded the mostly gospel, with Chuck Berry songs, and Elvis doing impersonations of Country Singers Bill Monroe and Hank Snow as well as impersonating Jackie Wilson who sang lead for Billy Ward and His Dominos, whom Elvis had just seen perform in Vegas. A copy of the tape was made for Elvis and it was located in the 1980s in his Graceland bedroom closet, along with a recording of the 1956 Tupelo Homecoming show and an interview with Elvis and both of his parents. 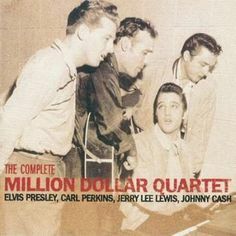 The four ended up taping some songs together, but recordings from the impromptu session would not be pressed on to discs for another 25 years when they were released as “The Million Dollar Quartet”. 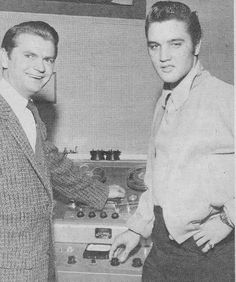 Elvis Presley had a copy of the session tapes which RCA used, while the Sun Studio was later sold and their original tapes were used by the new owner. 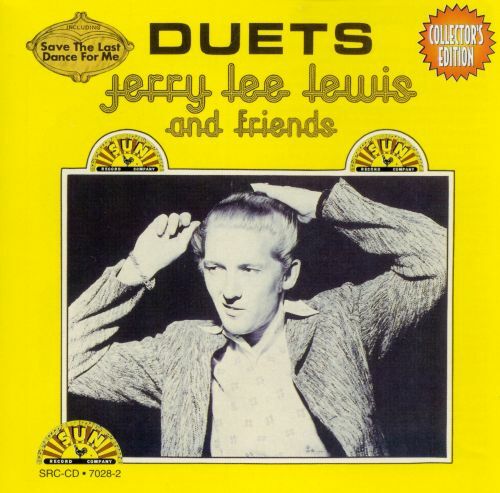 Who also had Jimmy Ellis sing “Elvis on Jerry Lee Lewis recordings. After hearing reports that many US radio stations had banned Elvis’ Christmas album because of their shock over “the Pelvis” singing religious songs, DJ Allen Brooks of CKWS in Kingston, Ontario, plays the entire album and invites listeners to call in their opinion. Of eight hundred callers, only 56 disapprove of Presley’s sacred music. This entry was posted in Elvis Presley, Elvis Romance and tagged Carl Perkins, Elvis Presley, jerry Lee Lewis, Johnny Cash, Marilyn Evans, Sam Phillips. Bookmark the permalink.